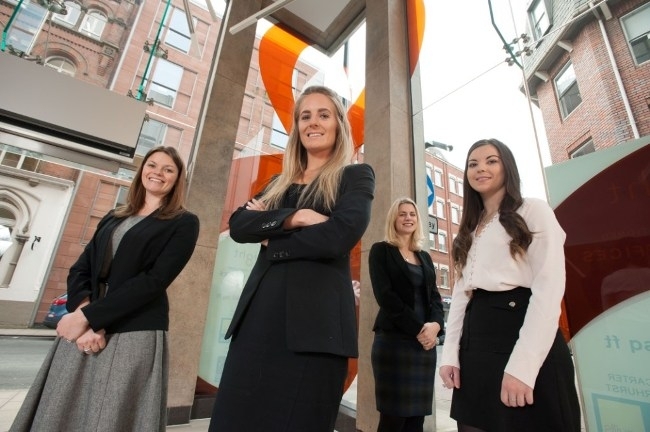 Leeds family law specialist Jones Myers is reinforcing its commitment to developing young talent with four new appointments. The 28-strong practice – applauded as ‘A genuinely brilliant firm’ in the Chambers 2016 UK Guide – includes qualified in-house counsel, mediators, an arbitrator and a deputy district judge. Elizabeth Bell, who is experienced in complex, high value cases and has represented clients across the UK and overseas, joins the divorce and finance team along with fellow solicitor Rosanna Kelly – a member of the West and North Yorkshire Young Resolution Committee whose expertise spans wide-ranging cases. Solicitor Polly Coram and paralegal Kate Wootton are the latest additions to the contentious trusts and estates teams headed by Martin Holdsworth – the only contentious probate lawyer in Yorkshire that has been individually ranked by Chambers 2016 guide and named a leading individual in his field by the latest Legal 500 guide. Martin said: “Jones Myers’ lawyers boast a combined 250 years of legal experience and attracting, training and developing young talent remains a priority for us. Jones Myers’ Essex office is headed by David McHardy, a family mediator and former chair of Resolution with over three decades of experience.